Website builders are designed to make it easy for users to establish a professional and appealing representation on the web. Both Wix and GoDaddy boast a high level of recognition if compared with other website building platforms. They appear to be a good choice every time you think of building a website from scratch with minimum efforts and no technical skills. Wix is a website building industry’s big name with plenty of advantages and great features delivered to its users. It offers a selection of 70 categories of professionally designed templates that are easy to edit and customize. Wix has a variety of affordable plans to meet users’ expectations despite their goals. It is easy to use and has enough features and add-ons to create a decent website within a day. Initially launched as a web hosting company, GoDaddy also made a name for itself as a trustworthy domain name provider. It has been operating since 1997 on the market. Today, it has transformed into a simple and sometimes a bit straight forwarded website builder featuring dedicated hosting, several plans to choose from, professional customer support, user-friendly and intuitive hosting cPanel for Linux or Plesk for Windows. So, what is the best software to choose? What possible pros and cons differ Wix from GoDaddy? What the website builder is better and why? Let’s find out! Wix has a drag-n-drop function making it easy to work with content, add new blocks and pages, download media files of a different format, change colors, fonts and other elements you need to establish a unique style for your future website. Wix follows the latest technological trends. The platform has recently introduced Wix ADI – an artificial design intelligence to make the building process easier. AI-based technologies make it easy to create a stunning website almost instantly in accordance with your goals and requirements. GoDaddy cannot boast such innovations, although the platform is pretty easy to use. You will never ask yourself “what should I do next?” when using this website builder. It offers a logical and straight forwarded onboarding feature. Once you have signed up, the software will accurately guide you from one building step to another right until you need to press the “publish” button. At the same time, the platform does not have a drag-and-drop feature. This fact makes the builder too limited when it comes to editing and customizing pages. Adding media files and text is pretty simple. You can also remove or replace the sections you need. Wix vs GoDaddy. Both platforms are extremely easy to use. No special skills or technical; knowledge is required. GoDaddy and Wix are perfect for users who are about to build their first website without having the foggiest idea of how to get started. However, GoDaddy is a bit too straight forwarded with a limit set of editing instruments. Wix. The platform offers a wider range of widgets and add-on. It boasts its own App Market where you can choose any widget you need and it is free. All apps and add-ons are included in your monthly plan price. You do not need to overpay for each and every improvement. Wix offers and advanced blogging function. Simply choose it in the menu to add a new blogging section to your website. Wix has a PRO gallery, maps, analytic tools, forum sections, calendars, subscription forms, event widgets and plenty of other handy elements that will improve your users’ engagement and experience. Wix SEO Wizard will let you benefit from higher SEO rankings offering an effective SEO plan. Need to build a decent online store? 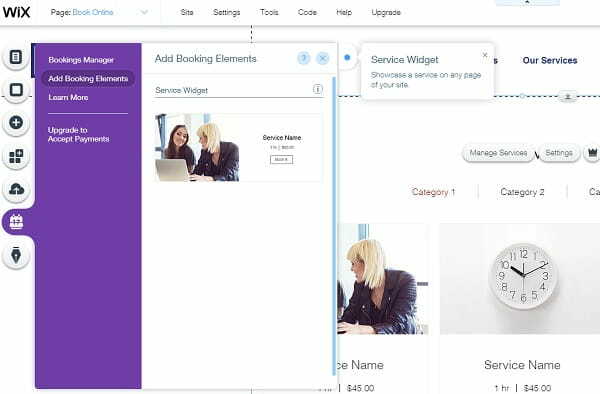 Wix ecommerce features will let you manage products, set different payment options and deal with taxes & shipping. If you still have difficulties when creating a stunning design for your website, over 100 Wix professionals are waiting for their chance to help you. Simply make a request and a professional designer will keep in touch with you. GoDaddy. The service does not have its App Store, which is certainly a huge miss. On the other hand, users can opt for some basic functions like social media sharing or image gallery. You will also be able to add your website to Google AdSense. If you need some more comprehensive options like Paypal button or SEO Wizard, you need to purchase at least Business Plan. Speaking about SEO Wizard, it looks simple and guides a user from one stage to another letting edit titles and descriptions. The problem is that GoDaddy has a strange heading order that has no sense. Google may not like it. You may add a blog, but you will have to host it somewhere else. Wix vs GoDaddy. GoDaddy offers themes with some pre-set elements. For this reason, it is sometimes hard to add new functions or widgets. On the other hand, Wix provides an access to its App Market with a huge selection of add-ons for any purpose. From this point of view, Wix looks more flexible and versatile. Wix is a more flexible and versatile platform. Users can choose from 70+ different categories of professionally designed mobile-optimized templates. 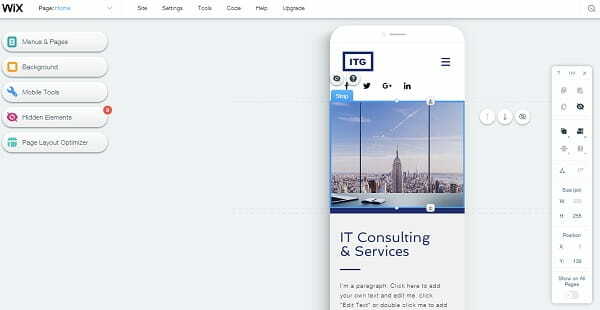 It lets you both review and edit your templates in a mobile mode. 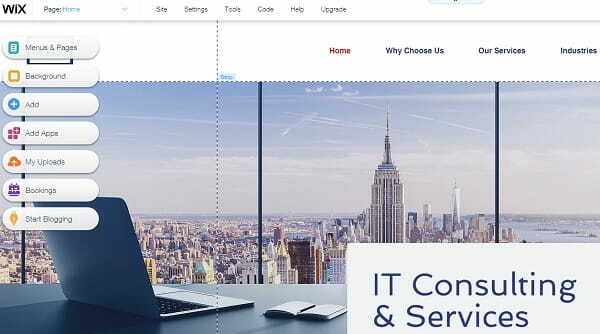 Apart from a drag-n-drop function for a simple editing and adding new elements to a necessary page, you can edit your menu, change colors, and attach media files in various formats, work with typography and establish an exclusive style for your website.The only drawback is when you choose a template, you need to stick to eat. There is no export function. GoDaddy offers a limited set of templates. Moreover, you will not have a chance to change them in accordance with your needs. The lack of drag-n-drop feature makes it impossible to change background colors, fonts, typography, etc. Although you still can add new sections or delete blocks, all templates have already-designed elements that you are not able to customize. The templates look just fine. There is nothing brilliant about them although they are mobile-friendly. All pages are good-looking enough. However, keep in mind that you will never get a chance to go far beyond the basic design settings. It is impossible to proceed with any layout changes. Forget about editing HTML or CSS. All you can do is choose a color and the general style for your theme. Wix vs GoDaddy. Wix looks like a more versatile website building software for those who want to build a stunning website that differs from others alike. GoDaddy has only some basic instruments that are too limited if compared with professionally designed Wix templates for various purposes from catchy modeling blogs and portfolios to e-Commerce websites and digital stores. Wix. The website builder has an enormous knowledge base and blog, where you can find some useful information. At the same time, you are free to request a chat support in addition to simple tips on how to submit your tickets in case any problem occurs. GoDaddy. The platform boasts a professional support team, which is a must for any company that provides hosting and domain services. As for the website building software, GoDaddy has a huge knowledge base, a forum to ask any question and a worldwide support by phone. Users are free to contact support managers during the working hours. You can find the list of all phone numbers around the globe in the support section. They also indicate the working hours for a particular country. The company offers different products that include not only website building tools and domains, but also SSL certifications, online auctions and more. For this reason, you will hardly face any difficulties when getting in touch with the support specialist to resolve any issue. Wix vs GoDaddy. GoDaddy seems to have more options for users to keep in touch with the support team. On the other hand, resolving an issue may be daunting considering the number of products they sell at GoDaddy. Wix managers are more focused on the issues related mainly to a website building process. Wix. The platform offers a free plan although with only 500 MB of storage without a domain name or hosting. However, for only $8.50/month you can purchase a Combo Plan and get everything you need in a pack. SSL data security, free hosting, and domain, free templates, widgets and add-ons are already included in this price. Do you need to build a more complicated website with plenty of features and complex structure? Unlimited Wix plan starts from $12.50 per month. It is perfect for larger projects. Need a solid web store? E-Commerce plan is right for you for only $16.50 per month. VIP plan costs $24.50 per month with extra features for professional marketing and e-mail campaigns. GoDaddy. If you opt for this software, prepare to pay for every new feature and update you want to add. The plan price for a website starts from $5.99 per month. Looks like an affordable offer, doesn’t it? However, it does not include any features and add-ons you may need in future. You need to pay at least $29 per month for a plan that includes additions for e-commerce. If you need SSL protection and links to social media, you will need to pay more for a Business or Business Plus plans that cost $9.99 and $14.99 respectively. Wix vs GoDaddy. Wix certainly looks more attractive from financial perspectives. You do not need to pay separately for each and every widget you need to add. A user gets everything in the pack for a single monthly payment. After GoDaddy made a name for itself as a leading hosting service and domain provider, it is far from being perfect when it comes to website building instruments. Although the builder is very simple to use, it lacks the flexibility, extra features, and editing tools. From this point of view. Wix looks more professional and versatile. It offers more affordable plans, it lets users establish their unique online style and improve their web presence.